The lunation of 5 in your eleventh solar house will show you how to build a productive project. This month of April will also favor a friends's reunion or the beginning of a partnership or association. You will know for sure around full moon. This period will favor team spirit. Whether you practice a sport or not, people appreciate your enthusiasm. You need to let people lead the way and keep the seat you have chosen in this life. With Venus in your tenth solar house, you will have high expectations in your activities and will get benefits from it if the economy is good. It's a very interesting period at work. You will manage to sign a contract or to finish a project you were working on for a long time. With Venus in dissonance with your decan in the week of 7, stop trying to replace the lack of love in your life by material things, chances are it will probably not be the best option. In the week of 7 Mars is in conjunction with your Sun and you will go through a rough patch with many things to take care of and the risk of being overwhelmed by the events. During the week of 21 Mercury is in harmonic aspect and will help you adjust to circumstances and act pretty fast, which is good for business and when you have to travel. During the week of 21 Venus is in harmony with your decan and it will increase your magnetism. You will get along well with people, they may invite you for dinner or give you gifts and compliments. 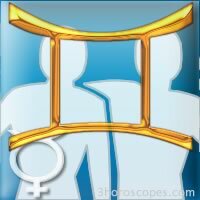 Gemini, do you know your zodiac sign ?